Allen Stone Radius The deluxe edition digipack features new cover art, six brand new tracks and an alternate version of the hit Freedom. 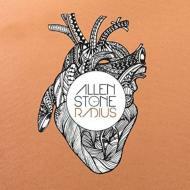 - Allen Stone is returning home to ATO Records for the deluxe edition release of Radius. The deluxe edition features six brand new studio tracks in addition to an alternate version of the hit Freedom. Stone proves himself deeply devoted to making uncompromisingly soulful music. Made in collaboration with Swedish soul phenom Magnus Tingsek.